The discussion of the Tucson tragedy should be familiar, as we witness similar massacres in U.S. schools, shopping centers, and other public places played out periodically. Each time, the NRA and other gun apologists tell us that the easy accessibility of firearms, including assault weapons, had nothing to do with it. Indeed, they argue that the key to our safety is to obtain more guns. But does the fact that nearly 100,000 Americans are shot with guns and nearly 10,000 Americans are killed with them each year really have no connection to the remarkable availability of guns in the United States? A great deal of evidence suggests otherwise. For example, according to a recent study, when twenty-three populous, high-income countries were compared for the year 2003, it was found that, among civilians, the United States had more firearms and more handguns per capita than the other countries, as well as the most permissive gun control laws. Not surprisingly, the firearm homicide rate in the United States was 19.5 times higher than in the other countries. The U.S. unintentional firearm death rate was 5.2 times higher. Although this death toll is bad enough, consider also the fact that the same dynamics operate in international relations. No nation in recent decades has rivaled the military might of the United States. Indeed, the U.S. government spends nearly as much on its military forces as the rest of the world combined—presumably, to keep Americans safe. But are they safe? Not long ago, the greatest terrorist attack in history occurred in the United States, and more are constantly threatened. Meanwhile, U.S. military forces have been dying or coming home crippled from two very bloody, seemingly endless wars. Could a key reason for this disastrous situation be that brandishing more and more weapons not only fails to protect us, but actually pulls us into a deadly cycle of violence? Of course, the safety through weapons theory is particularly dangerous when it comes to nuclear weapons. Like the NRA, nuclear zealots assure us that massive nuclear arsenals will make us safer. Thus, as the price for approving the recent New START Treaty, they demanded—and received—a hefty payoff: a commitment from the Obama administration for $180 billion in funding over the next decade for "modernization" of the U.S. nuclear weapons production complex and the U.S. nuclear arsenal. But this kind of nuclear buildup encourages nuclear nations to do the same thing and helps convince non-nuclear nations to develop their own nuclear arms. Aren't we supposed to be working for a world free of nuclear weapons? Certainly, that would be a good idea. 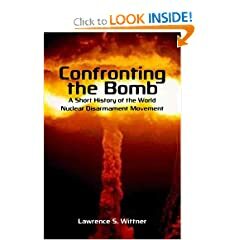 The more nuclear weapons that are available, the more likely it is that terrorists will acquire and use them, that embattled governments will employ them in their wars, and that they will be fired or exploded accidentally. We have had some close scrapes along these lines in recent years. These include terrorist nuclear plots, nations drawn to the brink of nuclear war, and the collision of nuclear submarines. Disarmament activists are sometimes accused of naïveté. But isn't it far more naive to assume that, in an angry world bristling with nuclear weapons, they will never be used? And so we are brought back to the mass murder in Tucson and the question: Are we safer with more firepower or less? Despite the propaganda of the gunslingers, the arms manufacturers, and the military enthusiasts, it does seem that the world would be a lot safer with fewer guns and fewer nuclear weapons. I'm sure some of these "gun-lovers" you mention might take your arguments as a personal insult. I can only speculate. Once one wades through the condescension and personal insults of your posts, one can find some excellent points - many of which I personally don't disagree with. If you plan on convincing anyone, though, talking down to them is probably the worst plan of attack. If you take my definite and clear answer to the main point of our one-sided debate as a personal insult, then I did insult you and all American gun-lovers as gravely, as it was possible. Enjoy! There, was that so hard. You pulled it off with only a few personal insults. people (like FBI, CIA, etc.) to carry guns when off duty. for refund, based on the qualified cost estimation, under the threat of criminal prosecution. in the course of the next decade. Don’t try to soften your rant with something as superfluous as “I hate to sound judgmental.” All your posts are judgmental and there’s nothing wrong with that. Feel free to openly express your opinion and call others opinions half-brained, invalid, and funny. It’s a luxury reserved for a minority of the world’s inhabitants. America, and the ever-expanding democratizing effect of the internet, allows you to voice your judgments without fear of violent retribution. Now, repeating the word “undeniable” does not make it true. Please feel free to use some of those “terrible facts” to back your arguments. Maybe you should find another outlet or hobby. Your posts seem to reveal a deep embarrassment and shame for your country and its history. America’s history includes many positives and many negatives; many successes and many failures; many innovations to enhance the quality of life and others to maximize death. How does focusing one’s energies exclusively on the negatives and mistakes benefit our current condition? Shouldn’t we learn from successes as well? Using history (this being HNN) as a guide, how do you propose to curb gun violence in this country? Do we ban firearms? Do we restrict certain types of firearms? Do we legalize previously banned firearms? Do we restrict licensing? Do we ban media violence, which can desensitize and glamorize? Do we become more like Europe? Do we become less like Europe? I hate to sound judgmental, but I found it really symbolic and funny, at the same time, that the great Russian poet A. Pushkin was killed with a bullet coming from a gun fired by the man with your last name? And now, two centuries later Dantes argues in favor of indivisible right of people to own carry firearms. The same is true about the US foreign military "campaigns". Therefore, your comparison of a minute (on the US national scale) above) Tucson's violence with the truly national-scale riots in three other countries (plus, Greece could not be considered among the most modernized, i.e. economically developed ones) is obviously invalid. Thus, my initial "undeniability" statement remains intact. "UNDENIABLE?" Arnold obviously has not watched any news recently. Several prominent politicians and innocent bystanders were shot in Tucson. Was the attacker tackled and torn limb from limb by the crowd? Was his family attacked and hanged in retribution? Were members of his ethnicity/religion/economic class hunted, tortured, and killed for vengeance? Did Tucson erupt in violence? Yet we see footage of extremely violent riots in England, France, and Greece over issues of rent control, tuition hikes, and deferment of entitlements. Poor Arnold... your life must be rife with perceived threats. was that this country is by far the most violent among all most democratic and modernized countries in the world (such as UK, Germany, Japan, Sweden, Norway, Netherlands, South Korea, Canada, Italy, and others.) - both domestically and abroad. It is UNDENIABLE and TERRIBLE FACT, gentlemen. A threat is in the eyes of a beholder. My owning a scary rifle does not in any way threaten you, and taking that rifle from me does not in any way protect you. If the author of this piece would bother to look at U. S. crime rates over the last 40 years, he would realise the fallacy he repeated. Crime has fallen as more and more guns have gone into circulation. No gun apologia necessary. Facts are facts whether the author likes them or not.